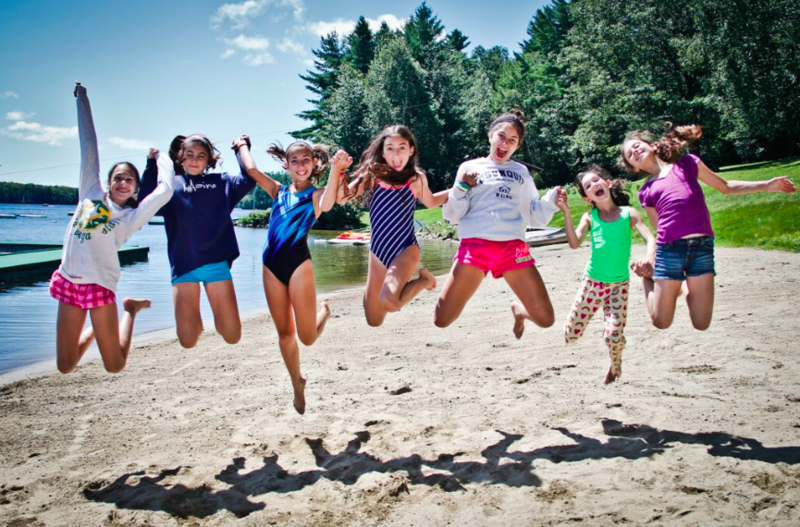 Whether you are a new camp family or your child will be returning for another great summer in Maine, it’s always a good time to be thinking about summer camp. 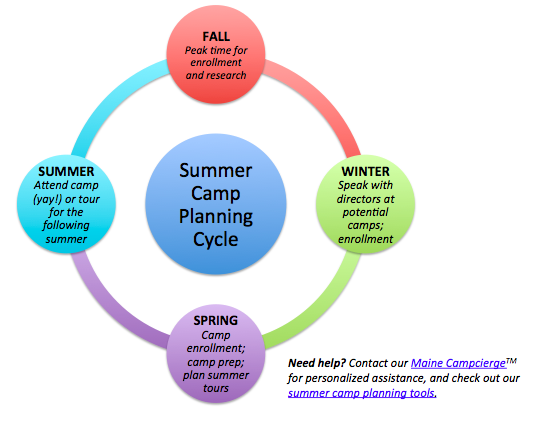 Besides camp just being a pleasant thought (especially on a cold day), the planning of summer camp happens in a cycle throughout the year. But don’t let that overwhelm you! We’ve broken down what to do, so finding or returning to the perfect summer camp is a breeze. First, let’s visualize, then I’ll go into detail. As you can see, there’s one or two things you can do each season to make the whole process manageable. Let’s start with fall, since that’s where we are now! If you already know which camp your child will be attending, or returning to, now is a great time to enroll, especially for full-session campers. Enrolling early provides the best opportunity of availability for a particular camp, age group, and session dates. It’s also a good way to plan the summer – first camp – and then other plans and vacations for pre- or post-camp, visiting day, etc. First-time camp families will find that it takes time to narrow the choices and select the right camp, so starting earlier is useful. Families can talk to Laurie, our Maine Campcierge™, and use the camp planning tools on the Maine Camp Experience website to select the best summer camp for your kids. Families can enroll for 2016 or plan to tour in 2016 for enrollment the following summer. Also, if you know a friend or family member who is thinking about camp, recommend they start now! By winter, camps are filling up in different age groups for the coming summer; so enrolling now is a good idea if you haven’t already. For new families researching camps, now is the time to ask your questions. With your narrowed-down list of summer camps in hand, contact the camp directors and get some answers. This will help you get a better feel for the camps, and pick the best one for your camper and family. To help you get started, check out this list of 21 Questions Parents Should Ask Summer Camp Directors NOW, compiled by our Maine Campcierge™. This is when it starts to get more exciting! If your child is headed to camp in the summer, make sure your enrollment is locked in. Then start getting ready – consult your camp’s shopping list, label everything, pre-address some envelopes for your child’s letters home, and get the trunks ready. Camp is coming soon! For new camp families, spring is a great time to start planning those summer camp tours. You’ll definitely want a chance to see your choice of camps in session, so you have seven weeks in the coming summer to check things out (note: camp tours may not be available the first and last few days of camp, visiting day weekends and large out-of-camp trip days). For new and returning families alike, now is also a good time to make some travel plans! Summer hotels in Maine book up fast, and taking the time to see and explore the natural beauty of the state is one of the great perks of having a Maine camper. Taking the time now to book flights and hotels will save you some stress as summer gets closer. Time to Plan Those Summer Camp Tours For Next Year! Ok, I think I spoke too fast back there. NOW is when it gets even more exciting! Summer camp in Maine is the absolute best. For returning campers, there’s nothing left to do but sit back and enjoy the ride (or parents … enjoy the quiet!). New campers will get their first taste of unplugging, having fun, making new friends, learning new things (like waterskiing and sailing on crystal clear lakes! ), enjoying great camp traditions and out-of-camp trips, getting a taste of independence and responsibility, and so much more!! Touring campers or campers who try Rookie Days or weekends will get to see and sample what it’s going to be like when they enroll and attend next year. Parents and younger siblings can enjoy Maine, aka “Vacationland” while the kids are at camp. No matter what phase you’re in, the return of summer means only one thing … the return to Maine, kids’ summer camp home away from home. If you need any help along the way, be sure to reach out to Laurie, our Maine Campcierge™. She is the expert in all things summer-camp-in-Maine related, and can help you by answering questions, offering personalized advice, and helping you make sense of your options. So start planning, and have fun!